The Warlu Way follows the path of the warlu, or Dreamtime sea serpent, as it traverses North West Australia and the Pilbara and Kimberley regions of Western Australia – ancient and sacred landscapes rich in natural beauty and enchanting Aboriginal stories. Your journey takes you back in time to the mystical Dreaming era when the warlu emerged from the sea and travelled through the pulsing red heart of the outback, forming magnificent waterways as he moved. Find out more about getting to North West Australia and travelling around the Kimberley and Pilbara regions of Western Australia. Check out the road trip itinerary. Be aware of road safety and health and safety issues. 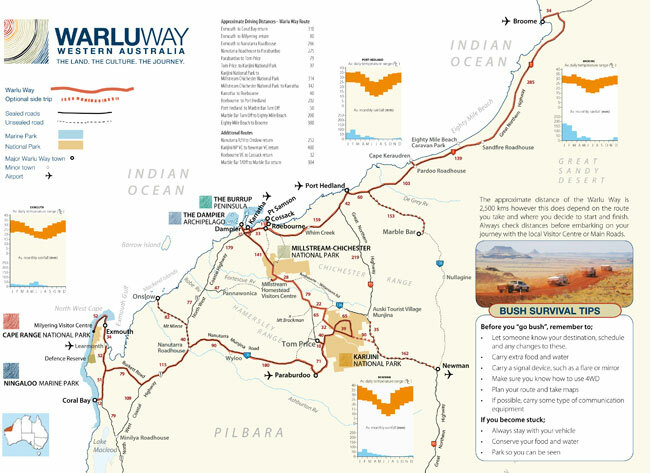 Contact the local visitor centres to start planning your ultimate Warlu Way adventure, and download the Warlu Way map here. Deep in the Pilbara, the Warlu Way reaches Karijini National Park, an adventure playground of plunging gorges perfected over two billion years. At Millstream Chichester National Park you enter the home of the warlu - a fairytale desert oasis of clear pools, palm fronds and water lillies. On the Burrup Peninsula (Murujuga), just outside of Karratha, lies the world's largest known collection of Aboriginal rock art. The historic town of Cossack has a rich and colourful story. Beyond the coastal towns of Onslow, Dampier and Karratha, your Warlu Way adventure brings you to one of WA's most bio-diverse marine environments, the Dampier Archipelago. Gasp in 'ore' at BHP Billiton's Port Hedland operations, or visit the Royal Flying Doctor Service and School of the Air. Australia's hottest town, Marble Bar is a unique example of a pioneering outback settlement established in the gold-rush of the late 1880's. Dine and camp under a star-filled sky at Eighty Mile Beach and Cape Keraudren Nature Reserve before completing the final leg of your Warlu Way adventure. Finishing in the exotic pearling town of Broome, drink in the sunsets at Cable Beach or head to the Dampier Peninsula for more Aboriginal cultural treats. Start planning your Warlu Way journey with the help of this 12 day itinerary.